Or in this case, woman. I fell in love with matcha at a Japanese tea ceremony almost 20 years ago as a guest of Wakai Dokokai. The tea explosion of recent years has brought matcha to the grocery store shelves … for better or worse. If you have a chance to experience the serenity of an authentic Chanoyou (tea ceremony) do so. You can also purchase your own whisk and bowl to fix your own at home. Always use high quality matcha and skip the packaged “mixes” which add sugar and artifical ingredients. Matcha is one of the most fun teas to play with in cooking. It’s super concentration means a little bit goes a long way. 1/2 teaspoon per 8 oz. serving. Matcha gets bitter with higher heat so don’t use boiling water. It actually mixes well for both hot and cold drinks. And the color is gorgeous! Below are some sources for matcha. I suggest trying some from the bulk tea section at New Seasons first. The good stuff can be pricey. Below is my recipe for a simple version of a matcha latte. VERY high in antioxidants, matcha is clearly the healthiest choice of all teas. When combined with organic, unsweetened soy milk – you get a low cal, calcium, protein, energizing fat buster that tastes divine. A great breakfast drink or early afternoon pick-me-up. Note: Matcha is highest in caffeine of green teas so watch that boost. 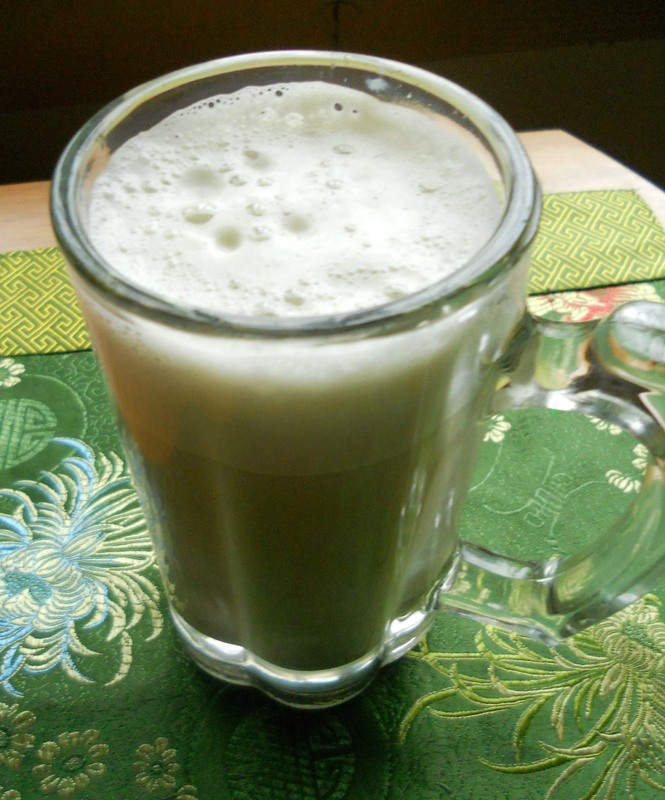 Warm Matcha Latte: Add 1/2 to 1 tsp matcha to 8 oz of hot water and stir a bit to dissolve. Heat about 6 oz. of soy milk (organic, unsweetened – I like Pearl ) and pour both liquids into a blender and whirl away. Pour the frothy brew into a tall glass mug or cup. Enjoy! Note: If you can’t do soy, substitute almond or rice milk. Read the labels and avoid those junk blends.